Good morning, Crafters! This is Gloria Stengel with you again. I love to make cards with TONS of layers, not only on the front of the cards, but also on the inside as well! I created two cards in this layered style, one that is 6" x 6" and one that is 6" x 5". Both are layered with lots of pretty paper. The inside of each card is decorated, plus they both contain a fun gift card pocket! There is still time to make some Valentine's Day cards! This one is perfect for that extra special someone, such as your favorite college student or best friend! 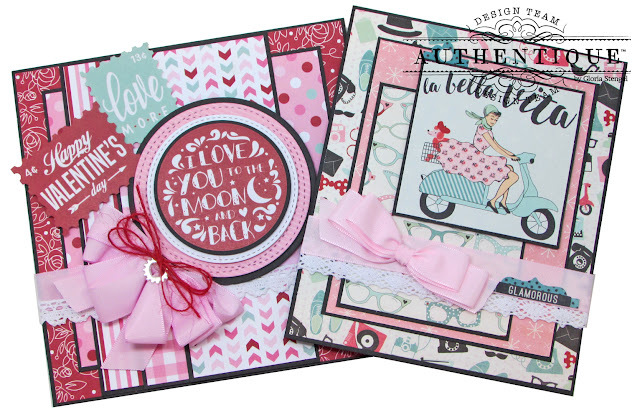 I used the Sweetheart Collection to create this pretty 6" x 6" card. The inside has plenty of space to write a message or add a photo. 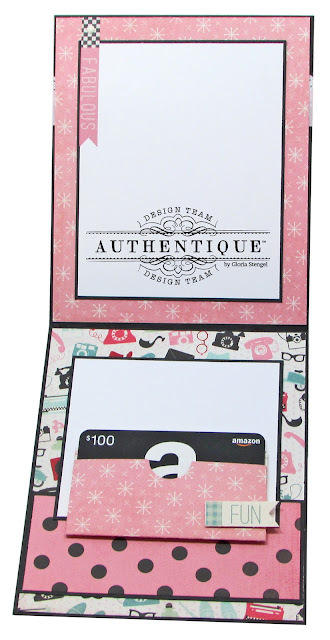 Plus there is a gift card pocket that fits a standard gift card, money, tickets, or even a small chocolate bar. 1. Cut black cardstock to 12" long by 6" wide and score on the long side at 6" to make a top-folding 6" x 6" card. 2. Cut Sweetheart Two paper to 5 7/8" x 5 7/8" and attach to the card front. 3. Cut black cardstock to 5" x 5" and attach to the front center of the card. 4. Cut Sweetheart Four paper to 4 7/8" x 4 7/8" and attach to the center black panel. 5. 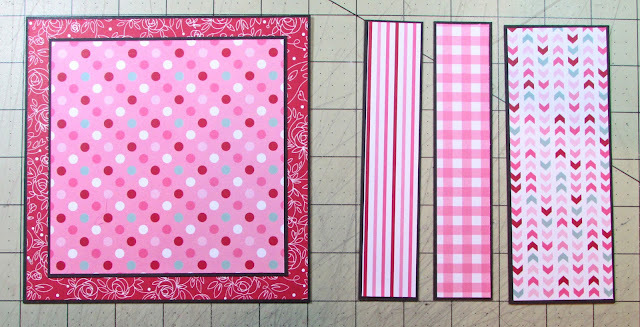 Cut Sweetheart Five paper to 5 3/4" x 1 1/8" and mat with black cardstock cut to 5 7/8" x 1 1/4". 6. 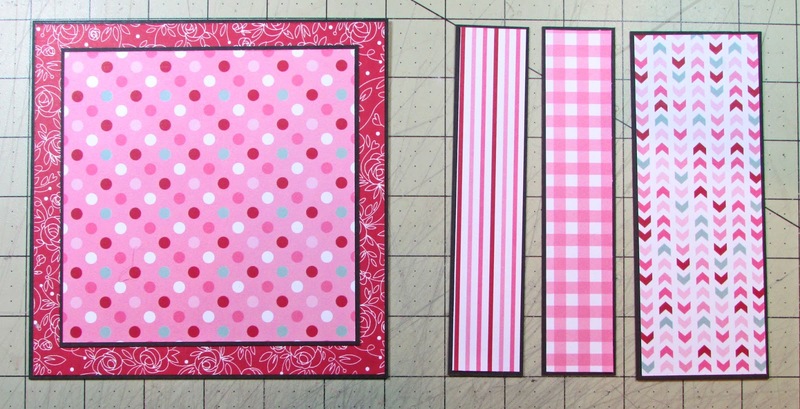 Cut Sweetheart One paper to 5 3/4" x 1 1/8" and mat with black cardstock cut to 5 7/8" x 1 1/4". 7. Cut Sweetheart Six paper to 5 3/4" x 2 1/8" and mat with black cardstock cut to 5 7/8" x 2 1/4". 8. Layer the three panels across the front of the card as shown, overlapping each print slightly. 9. Wrap a length of tulip pink taffeta ribbon around the card, approximately 1 1/2" from the bottom edge and secure on the inside of the card. Layer a length of white lace over the bottom edge of the taffeta ribbon and secure on the inside of the card. 10. 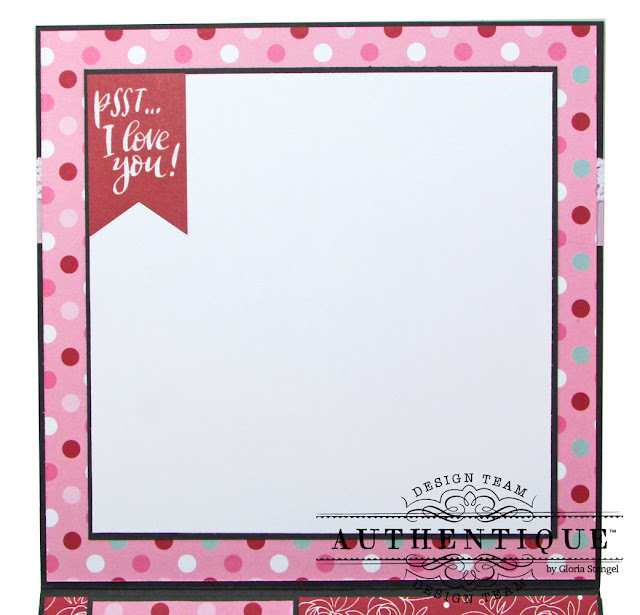 Remove the "love you to the moon" sticker from the Sweetheart cardstock sticker sheet and mat with a black cardstock circle, cut slightly larger. 11. Use various circle dies to cut white and black cardstock mats for the sticker embellishment. Also, cut one circle from Spectrum Series Tickled Pink One paper. Layer the circle stack, using foam adhesive between each layer, as shown. 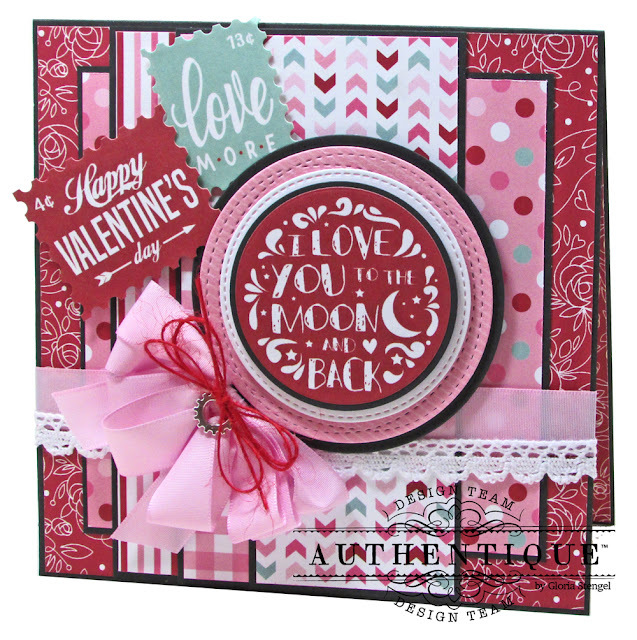 Attach the circle stack to the card front approximately 1" from the top edge and 1" from the right edge. 12. Remove the two postage stamp stickers from the sticker sheet and mount them onto scraps of cardstock. Attach them to the top left of the card using foam adhesive. 13. 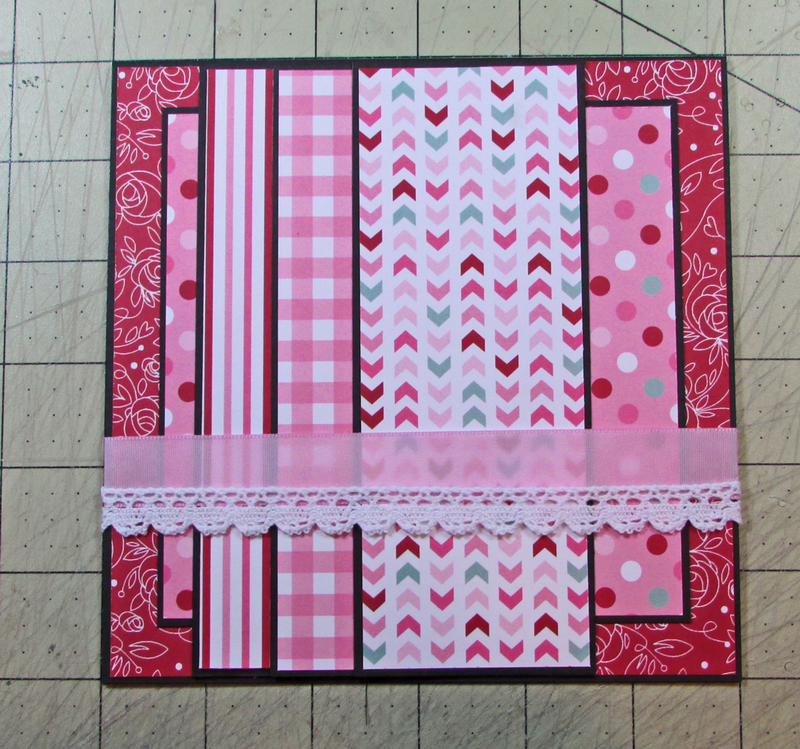 Tie a loopy bow from the tulip pink taffeta ribbon and glue it to the lower left edge of the circle stack. 15. For the inside top of the card, cut Sweetheart Four paper to 5 7/8" x 5 7/8" and attach it to the top panel. This will cover the tails of the ribbon as well. 16. Trim black cardstock to 5" x 5" and attach to the center of the card panel. Trim white cardstock to 4 7/8" x 4 7/8" and attach it to the black panel. Add the banner sticker to the top left corner of the white cardstock. 17. For the inside bottom of the card, cut Sweetheart Two paper to 5 7/8" x 5 7/8" and attach it to the bottom panel. 18. 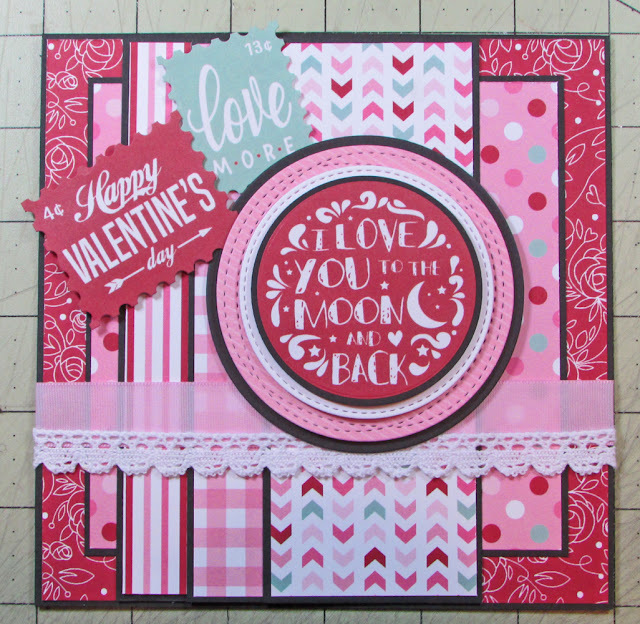 Cut Sweetheart Four paper to 5 3/4" x 2 1/8" and mat with black cardstock cut to 5 7/8" x 2 1/4". Attach the panel to the left side of the card, approximately 1/2" from the left edge. 19. Trim black cardstock to 4" x 4" and attach to the card panel approximately 1" from the fold and 1/2" from the right edge. Trim white cardstock to 3 7/8" x 3 7/8" and attach it to the black panel. Add the "my everything" sticker to the top right corner of the white cardstock. 20. Use a gift card pocket die template to trim two pockets, one from Sweetheart One paper and one from Sweetheart Six paper. Trim the top from the chevron print pocket and glue it to the INSIDE of the plaid print pocket. Assemble the plaid pocket (cut from Sweetheart One paper) so that the chevron pattern shows at the top inside. 21. Attach the pocket to the left side of the card as shown. Add the "true love" heart sticker to the pocket as shown. 22. 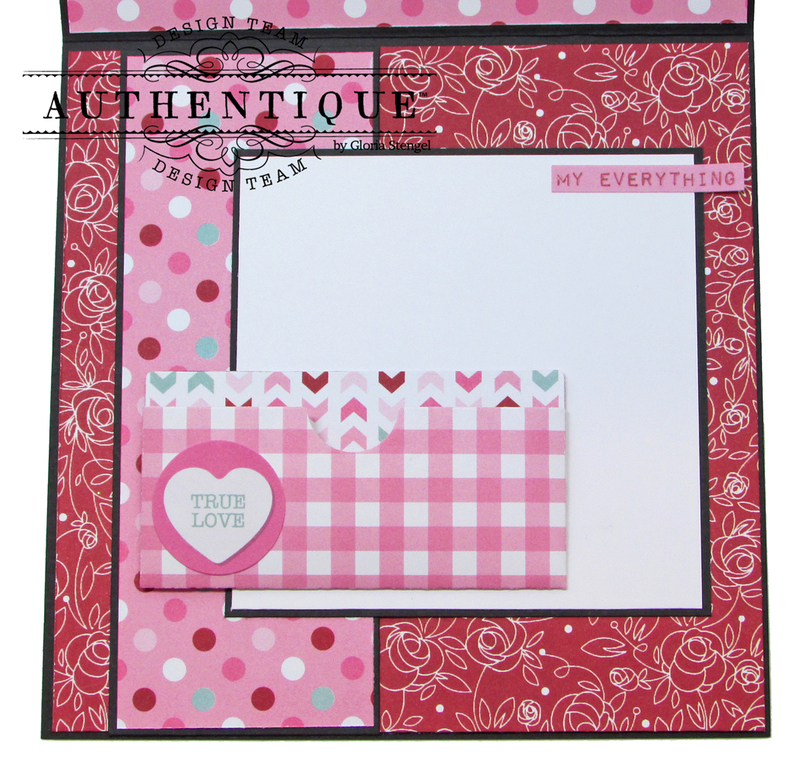 Optional: cut Sweetheart One paper to 5 7/8" x 5 7/8" and attach it to the BACK of the card. Since I have a few friends with February birthdays, I wanted to make a second card with a glamorous theme! I also wanted to show you that there are many ways to vary your card sizes and layers, as well as many ways to change up your prints! With Authentique paper collections, all the prints within collections coordinate perfectly! I used the Fabulous Collection, which is a bit of an older collection, but it's still available online and in some shops. You can use ANY paper collection for this card, just label your paper as Print 1, Print 2, and so on, and then follow the cut listed below. Again, I added lots of layers to the inside, plus there is space for a gift card pocket! 1. Cut black cardstock to 12" long by 5" wide and score on the long side at 6" to make a top-folding 6" x 5" card. This size is a bit more interesting than a square card, but slightly larger than a standard A2 card. You can use an envelope made for a 5" x 7" card for mailing. 2. 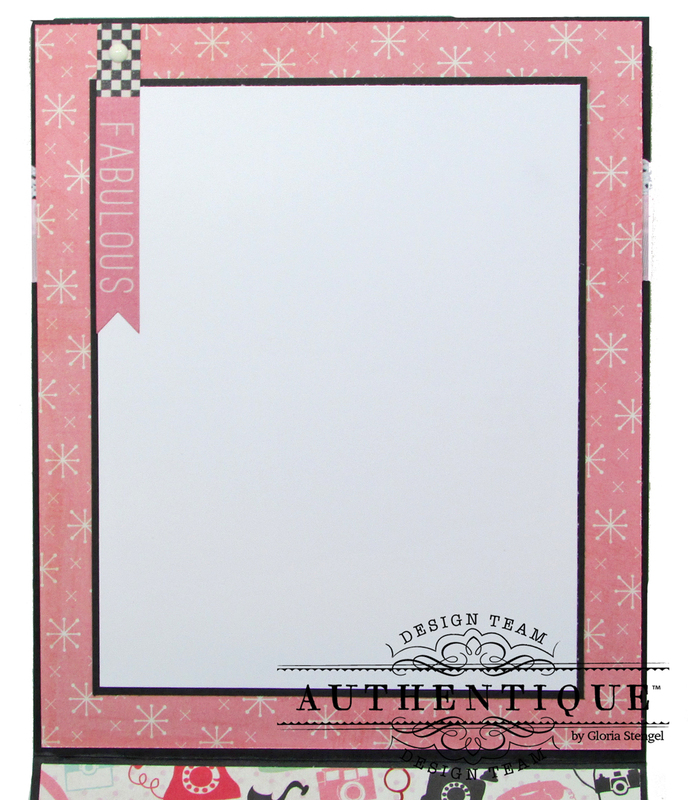 Cut Fabulous Eleven paper to 5 7/8" x 4 7/8" and attach to the card front. 3. Cut black cardstock to 5" x 4" and attach to the front center of the card. 4. Cut Fabulous Two paper to 4 7/8" x 3 7/8" and attach to the black panel. 5. 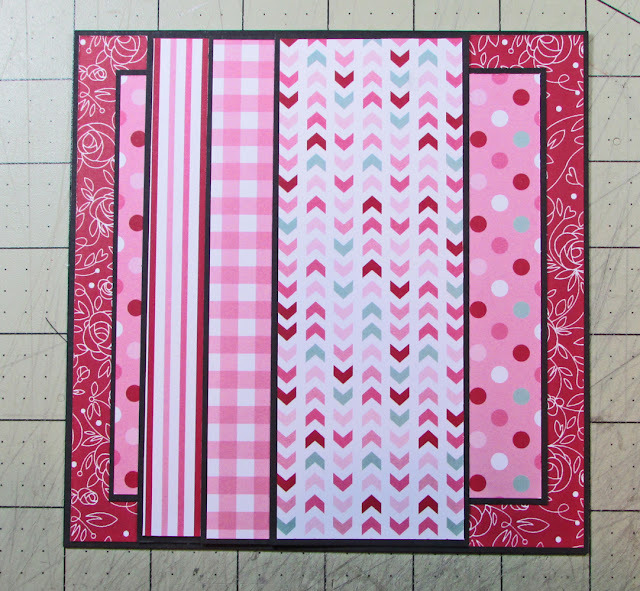 Cut Fabulous Six paper to 3 7/8" x 2 7/8" and mat with black cardstock cut to 4" x 3" and attach this panel to the lower left of the pink panel, as shown. 6. Wrap a length of white lace around the card, approximately 1 1/2" from the bottom edge and secure on the inside of the card. Layer a length of pearl pink taffeta ribbon over the top edge of the lace and secure on the inside of the card. 7. Trim the scooter image from Fabulous Twelve paper and mat with black cardstock. Use foam adhesive to attach the image to the card front approximately 3/4" from the top edge and 3/4" from the right edge, as shown. 8. Place the small, shaped tab sticker from the Fabulous Details cardstock sticker sheet above the upper left corner of the image. Add a white enamel dot to the center of the tab. 9. Place a larger, shaped sticker tab onto the right side of the ribbon. Add a "glamorous" sticker to the tab sticker, as shown. 10. Tie a loopy bow with the pearl pink taffeta ribbon and glue it to the left side of the card as shown. 11. 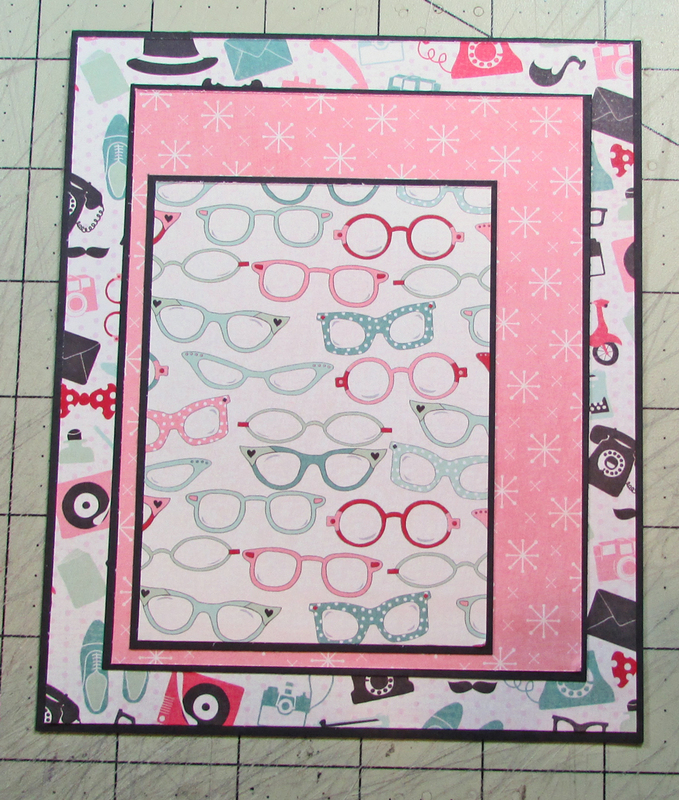 For the inside top of the card, cut Fabulous Two paper to 5 7/8" x 4 7/8" and attach it to the top panel. This will cover the tails of the ribbon as well. 12. Trim black cardstock to 5" x 4" and attach to the center of the card panel. Trim white cardstock to 4 7/8" x 3 7/8" and attach it to the black panel. Add the banner sticker to the top left corner of the white cardstock. Attach a white enamel dot to the banner sticker. 13. 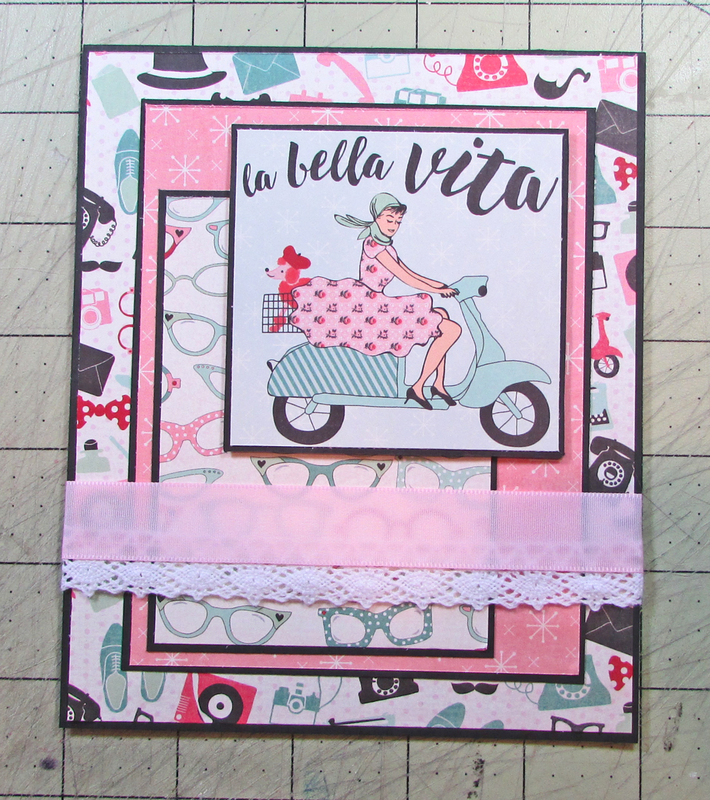 For the inside bottom of the card, cut Fabulous Eleven paper to 5 7/8" x 4 7/8" and attach it to the bottom panel. 14. Cut Fabulous Nine paper to 1 7/8" x 4 3/4"" and mat with black cardstock cut to 2" x 4 7/8". Attach the panel to the bottom of the card, approximately 1/2" from the bottom edge. 15. Trim black cardstock to 3 1/2" x 4" and attach to the card panel approximately 3/4" from the fold and centered left to right. Trim white cardstock to 3 3/8" x 3 7/8" and attach it to the black panel. 16. 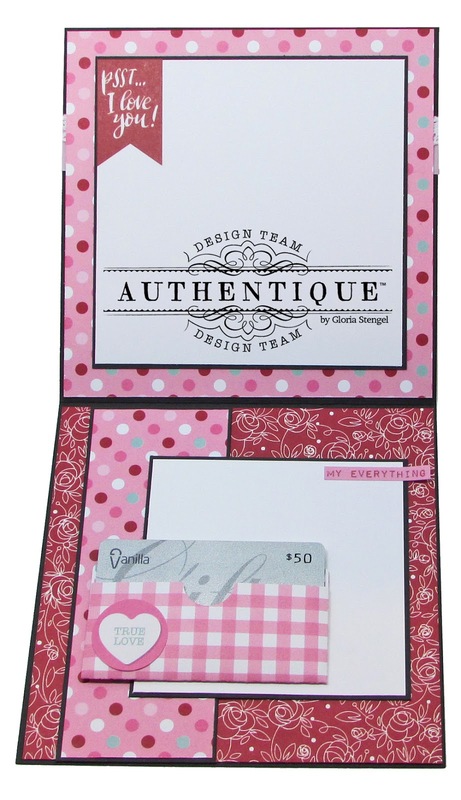 Use a gift card pocket die template to trim two pockets, one from Fabulous Two paper and one from Fabulous Six paper. Trim the top from the glasses print pocket and glue it to the INSIDE of the pink star print pocket. Assemble the pink star print pocket (cut from Fabulous Two paper) so that the glasses print pattern shows at the top inside. 17. Attach the pocket to the bottom center of the card as shown. Add the "fun" die cut banner (Fabulous Components) using foam adhesive to the pocket as shown. 18. Optional: cut Fabulous Six paper to 5 7/8" x 4 7/8" and attach it to the BACK of the card. You are finished! Thank you so much for looking!